A woman has been banned from owning animals for life after 176 animals were found dead at her home. RSPCA inspectors described animals in a "shocking state" when they were called by police to Maxine Cammock's property in Lincolnshire in October 2017. Cammock, 54, of Dyke Village, Bourne, admitted five animal cruelty offences at a hearing in June. Peterborough Magistrates' Court sentenced her to a community order requiring mental health treatment. RSPCA inspector Kate Burris said that of 201 animals found at her home and grounds, 176 of them were dead. They were mostly dogs, pigs and poultry. "There were the remains of dead animals everywhere, most in such a state of decomposition it was impossible to establish how they had died," she said. 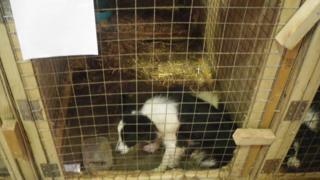 "Several collie type dogs were in a shocking state in filthy pens in one of the buildings. Two of the dogs were dead, one in a pen with two other dogs. "A pig who had eaten a bucket of rat poison was dead in another of the buildings. Cammock realised what the pig had done and, rather than seek vet treatment, locked him inside." Ms Burris said that the RSPCA took the surviving animals into care. When inspectors returned a month later "yet more animals were found to be having their needs not met", including chicks packed into plastic containers. As well as the 18-month community order, Cammock was ordered to pay costs of £250 and a victim surcharge of £85.